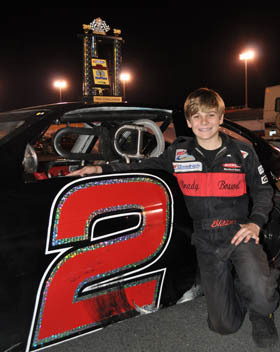 In one of the most electrifying and dramatic races in the history of the Pro Challenge series, Brady Boswell scored the victory in the 50-lap, double-point Pro Challenge National Championship event held Saturday at Concord Speedway in North Carolina. The victory, combined with the misfortunes of other championship contenders such as polesitter Meghan Dillner, Kyle Benjamin, Stephen Bergh, Jr. and Brandon Williamson, allowed Boswell to jump from tenth to first in the standings to become the 2009 Pro Challenge National Champion as well as the series’ Rookie of the Year. Meghan Dillner entered the event tied with Kyle Benjamin for the National Point lead, but Dillner took a slight advantage at the drop of the green flag thanks to her track-record-setting pole run in qualifying. After two attempts at the initial start, Dillner faded with a slipping clutch, leaving Bergh and Benjamin to duke it out up front. The two leaders then found themselves involved in a massive incident on the frontstretch, which also included Dillner and Brandon Williamson among others, eliminating several drivers’ chances at the 2009 championship. With the title up for grabs, Brady Boswell took advantage of the other point leaders’ misfortunes and survived several restarts, holding off a hard-charging Casey LaJoie and Pro Challenge veteran Devon Haun, for the victory. With double points being paid in the event and the bad luck for drivers such as Benjamin, Dillner, Bergh and Williamson, Boswell was declared the 2009 Pro Challenge National Champion. Boswell completed a dream season at Concord by securing both the series’ Rookie of the Year and Championship titles. Brandon Williamson, a Pro Challenge Sunshine Region regular, recovered from damage suffered on-track to complete enough laps to take the runner-up spot in points. Dillner finished third in the standings, followed by Benjamin and Bergh. At the checkered flag at Concord, Casey LaJoie followed Boswell to the line, with Devon Haun, Kyle Plott and Williamson completing the top-five finishers. Following the event, Pro Challenge officials performed a thorough technical inspection of the top five finishing vehicles at Concord and several parts were brought back to the series’ headquarters in Tennessee for further evaluation. Following the checkered flag, fourth-place finishing Kyle Plott was deemed not to have a spotter for the second half of the event in the designated spotters’ area, which was against series rules for the championship event, resulting in a 50-point fine. Further technical issues with Plott’s igntion box were found in post-race inspection and possible penalties will be announced pending manufacturer inspection. Brady Boswell celebrates his 2009 Pro Challenge Series Championship, Rookie of the Year title and race win all at the same time at Concord. 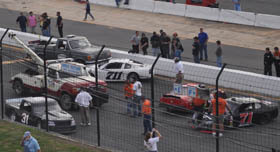 Several of the championship contenders were taken out in this big crash on the frontstretch.